Excell announces the launch of their new and improved FJ5 IP66 Waterproof Crane Scale for heavy duty use in harsh industrial environments. This FJ5 is a fulled featured, rugged indistrual crane scale with standard features that include a waterproof enclosure, 1" five digit high intensity LED display, simple, easy to use rechargable battery pack, wireless remote control, 360 degree swivel hook, and portable handheld indicator. 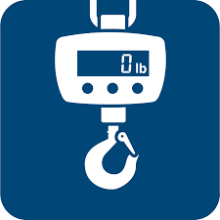 With capacities ranging from 2,000lbs (1,000kg) to 30,000lbs (15,000kg), FJ5 now comes standard with Bluetooth connectivity with android smartphone or tablet using the EXCELL Scales APP for viewing and recording weights remotely. FJ5 comes with portable handheld indicator that is durable and functional. It incorporates a built-in rechargable battery and offers Bluetooth wireless communication capabilities. For data management needs, FJ5 can be supplied with Excell's exclusive Weighing Data Collection Software (WDCS) that collect weighing data including item name, item number, header text., etc to a PC via a bluetooth doungle, which make data management and data backup easier.